Think out of the box and make organization charts of character, like no other. Gain customizable charts in various ways, super easily. If you don't want to stick to convention and prefer to break the rules to make difference, Edraw is always ready to help you. In terms of organization charts, a set of custom shapes and a group of customable templates are embedded for making creative charts. The easiest and fastest way to customize organization charts is taking advantage of finely-designed templates. You only need to add or delete some shapes, add text and them fine tune it. Done. If you step on paved roads instead of paving yourself, you will run faster for sure. See how amazing Edraw's templates are right now. Here is a custom org chart template, with creative layout consists of unique shapes. If you have innovative ideas about organization structure visualization but don't know how to show them, let Edraw team help you. A unique org chart showing the company structure. With illustration, it become more vivid. Click the hyperlinked thumbnail picture on the left to view full version and download. Edraw includes lots of custom shapes for your option, including ellipse shape, highlight shpe, tables and tree shapes etc. By combining them in different ways, users can gain limitless possibilities. These are editable vector shapes. Most of them are attached with text Boxes. Follow the steps below to apply them. After Edraw is started, point to New. -> Select Organizational Chart in the middle pane. 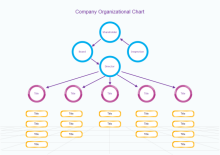 -> Double click Custom Organizational Chart in Templates group. -> Custom shapes library opens along with a blank canvas and libraries of Background, Borders and Arrow Shapes. -> Drag and drop shapes onto the canvas. To diversify your chart and make it vivid, you can add some clip art. 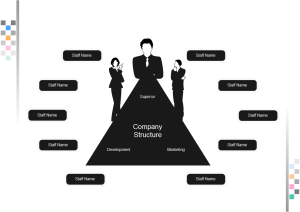 Now let's take the Company Structure as an example. 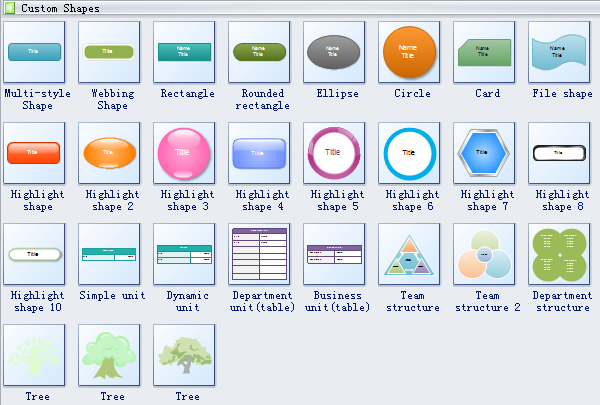 Besides the libraries opened automatically, two more groups of shapes are needed: People and Business illustrations. Open them by clicking the Libraries button and then choosing the Illustration group.